The location was awesome, food great, service brilliant, accommodation good, some drink suspect amenities really good, people and staff really friendly. There are five restaurants Brazilian, Japanese, Italian, and the steak house, all of which are splendid on the eye and serve up some great treats. The Riu palace is a beautiful hotel, and though it is starting to age a bit is still superbly maintained inside and out. The gardens are regularly trimmed and edged almost daily the beaches are very clean and seem to go on forever it is difficult to find anything bad to say about this resort. The one thing I would say is that some of the spirits you order may not be the brand you ask for, for instance jd and coke rarely tasted authentic amongst others. We travelled to the Dominican after having our trip to Mexico cancelled due to the Swine Flu epedemic, I was not looking forward to going as we had our mind set on Mexico ( went to Riu Tequila in 2007 )We changed to Punta Cana and the Riu Palace just days before flying, the hotel looked fabulous in the brochure and on arrival we were not dissappointed, the hotel is huge, the lobby and reception is very grand with fountains and paintings all over the place, the check in took minutes and our luggage was transported to our rooms by the ever helpful bellboys $2 tip and they were happy, the room was a junior suite and comprised of a king sized bed, large bathroom with hydo-jets in the bath along with a shower, there is the fridge and optics, beer and water and soft drinks in the fridge, replenished dialy, if you run out just phone reception for more. Down three steps and into the sitting area with settee and satellite tv ( was able to watch Newcastle matches live!! )out onto our balcony that overlooked a tropical jungle. Downstairs we walked out to ponds and fountains before heading down to the pool areas, one infinity pool leads onto the large pool with swim up bar, you get fresh towels everyday to use on the beach or pool area. Then down to the piece de resisdence, miles and miles of powder white beach, and electric blue Carribean seas. There are plenty of sunloungers on the beach and pool areas, waiters serve you refreshing cool drinks on the beach and pool areas, plenty of things to do by the sea, I learned how to sail on a hobie-cat ($25 for first lesson then free every other day) parasailing, bannana boats etc. The food was good with a buffet restaurant ( breakfast, lunch and dinner ) and 4 other a la carte restaurants that you have to book. Lunch is also served in the La Altagracia restaurant by the beach, being a guest of the Riu Palace allows you to use the facilities of the 4 other Riu hotels in the vicinity for lunch and drinks, although they cannot use the Palaces facility. Daytime activities are encouraged by the hard working animation staff but a polite no and they will pass by, night time entertainment is put on by the hotel and is ok, if sometimes amatuerish. But after a long day sunbathing, sailing, drinking, people watching we were wacked at around midnight. Would definately go back here, but now i have been in a "Palace" i would like to try the Riu Palace in Playacar. We booked this 5* hotel via Thomson. We usually stay in Bayahibe at the Iberostar Hacienda Dominicus but we decided we didn't really want the 1.5hr transfer so the Palace was a better option as it was only a 30 minute transfer via a private taxi. It is classed as an Al a Carte hotel in the Thomson brochure and is exclusive to Thomson in the Uk unless you book independently and not through a travel agent. When we drove through the Riu resort guarded gates and up the passed the staff quarters which in themselves are the size of a hotel, we could see the resort complex was of great magnitude. There are 5 hotels set in the complex 4 of them are beach fronted and the other is a short 500m walk. 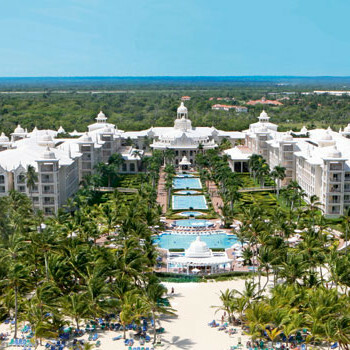 The Palace Punta Cana is an exclusive hotel, guests there may use the facilities at all the other Riu's in the complex but the guests from the other Riu's cannot use the facilities at the Palace Punta Cana. Anyway, we arrived via private taxi and I was in awe at the site of the huge palace appearing in front of me, it stood out in all its glory, like a prized trophy. We drove up the sweeping drive, and arrived at the rotating door, the sort you see at the Ritz and in movies. The bell boy took our luggage and we checked in. Wellington the guy who checked us was very brushed up on his English and struggled to understand what we were saying, he simply handed us the keys to our room and safe and walked off. I then went back and asked him where to go in order to find my room. He pointed to the left side of the lobby and said that way and walked away again. The lobby itself I might add is bigger than a football pitch! Well of we trotted, the three of us, tired but excited at being somewhere so lavish, trying to take in all the surroundings. We walked along the open corridors looking at the beautiful palms and blue skys. We came to our room which open and waiting for us. It has to be said that the room was lovely, the bed could easily have slept all three of us and more. As you walked in through the door, there was the bathroom to the right, which had a whirlpool bath with overhead shower. Double sinks set in marble and a WC. Directly facing the door were the built in wardrobes, which for a change had an abundance of hangers also inside the wardrobe were the iron, ironing board and safe(the safe is gratis). To the left of the door was the built in fully stocked fridge, a counter with glasses and ice bucket and a cabinet with four bottles of spirits, rum, brandy, whiskey and vodka. The mini bar and spirits are all part of your all inclusive package and are restocked daily. There was a arched area to the left and then the huge bed with a bedside cabinet either side and an alarm clock the standard bench and little table. the two steps down to a seated area, which had a sofa bed already made up for our daughter. There was a big dresser with 6 large drawers and the TV. Then the patio doors to the balcony. There were also a mesh screen after the patio doors which was great for keeping the bugs out. We stepped onto the balcony and found it to have two reclining chairs with padded cushions. The view from the balcony was lovely. To the left you could see the sand and turquoise waters, and directly in front were the natural areas with palms and the beyond that the hotel rooms of the adjacent hotel. Below were well landscaped gardens. The hotel has 4 floors in total and is easy to get around as there are plenty of staircases and lifts. Going back to the room, it was very clean and we didn't notice a smell that so many other reviews had mentioned. Our luggage arrived some 10 minutes after us. We then decided to take a look around. Still trying to take everything in. We went down 3 flights of stairs and walked to the left and could see the magnificent fountains then the two pools, the first is a round pool with continuous flowing water, the second is the main pool, with a vast seating area, the first two rows have parasols. There are a good few hundred beds so you never had to fight for somewhere to lay. Unless you wanted to sit right in front of the pool. The pool wasn't really big enough for a hotel of this size but is serviced. It had 10 tiled beds plunged into the shallow water on the ledge, then it had a swim up pool bar, 4 table nooks, and two jacuzzi nooks. The bar was very well manned with 6 bar staff. One thing to note, is that eh tiled area around the pool gets very hot so make sure you always have footwear at the edge for when you get out if you get out! The pool is only 4ft deep all around, I liked this aspect. The pool bar doubles up as the beach bar, as the top side faces the beach, it has a seating area and railings so you can sit and watch the ocean. To the left or the pool is the lunch buffet/evening steak house. The toilets are also in this building. To the right is the towel hut and the spa. The hotel has 6 restaurants it has your standard buffet which has inside and outside dining, i do believe that the inside dining was non smoking. Like the pool there is enough seats for everyone! There are no toilets in the restaurant you have to walk a few hundred meters to the other side for those. Just near to the buffet, are the remaining restaurants, the Japanese, Italian, Gourmet and the Brazilian. Food at the buffet was a bit repetitive, and there were very few potato options other than chips of instant mash. More often than not the pork was rare, so we always avoided that! Also note that the lamb chops are cooked from frozen and again are very blood soaked. The only meat that was never rare was the chicken. Despite the uncooked aspect and the lack of potatoes we never went hungry in the 14 nights we were there. There was a pasta station and a junk food station, fruit and salad in abundance and always dessert. If there was nothing that someone couldn't eat then i'm sorry they were just too fussy! Our waiter Lorenzo was lovely, by the end of our first week we didn't even have to order our drinks he brought them over as soon as we sat down. The champagne is very nice not cheap tasting like it so often is nor are the house wines. The staff in general were not overtly friendly unless of course you tipped them on a daily basis, personally we like to tip at the end of our stay. However the animation team all 4 of them were always friendly and cheerful in their work. The water is a 'must see' lol. Jeff from the Brazilian, Lorenzo from the buffet; Saul from the beach bar and Chocolate from the animation team all great guys! As with all Dominican hotels the entertainment was not fantastic but they did try hard. I would of like to have seen more guest interaction and more children/teen activities. As this hotel is on a resort it was nice to be able to visit the rest of the hotels in the chain. They have their own street called Caribbean Street. There are lots of gift and clothes shops there and they all give change in $ unlike the hotel shops who only give change in peso and their rate is dire! There is a chemist and a doctors there and a photography shop worth checking out. The prices in the shops are pretty reasonable especially the sun creams. There is no cash point at the hotels but there is one at the staff accommodation at the entrance of the resort. Also there are no pubic phones at the hotel! There are various bars in the hotel, the sports bar has internet cafe, pool and table hockey ($3 per game) as well as a couple of arcade machines also $3 per game.This is where you can get 24hr snacks, hot dogs, burgers, toasted sandwiches and fruit as well as tortilla chips and cheese sauce. All the snacks self service and microwaved by you. There is also a room there with slot machines I think they take 25c. There is a casino at the Macao but it is not part of your all inclusive you can enter free of charge and water is free but all other drinks are extra. You have to place a minimum of $5 on a bet. The Pasha disco is usually full of hotel staff trying to hit on single female guests. Again this is not part of your all inclusive and can be expensive. The lobby bar is massive but closes at 12pm sharp. There are no last order calls and we found them to be very rude by turning all the lights and fans off even though we were still sitting there drinking! The reception is manned over night but don't expect them to be available if you call down. The Beds are huge but solid, but still sleep-able. The hotel boasts a turn down service we only encountered this twice in our fortnights stay but others we met said they got a turn down service every night. Indeed there was a very mildew smell on the pillows and when the air conditioning was on, but nothing some fabreeze wont cure during your stay. Our daughter slept on a double sofa bed the annoying thing about this apart from the smell of the sofa was it the mattress was covered in a plastic which made an awful noise every time she turned over and believe me she is a real fidget at night! There was also a noise every time the persons above flushed their toilet, we found that other guests said they noticed this too so it was common throughout the hotel. There is a lot of noise with room service in the morning and guests returning from the casino and disco in the early hours but we soon got used to it. The beach was massive but i disliked the fact that there were so many loungers it reminded me a little of being in Spain. There is plenty of shade on the beach if you don't want to sit up front by the sea. The beach bar staff come round on a regular basis with soft and alcoholic drinks. There are a few traders on the beach selling jewellery and shells but if you say no they don't bother you again. Scuba Caribe and Captain Cooks also scour the beach along with water taxis and para sailing traders. Be warned these have no insurance but looked like fun. Maybe if I lived more dangerously I would of had a go of the para-sailing or the air boat now that looked really cool. There were lots of helicopters too that toured the sky along the resort. The beach itself was nice but the sea was a little rough at times with a strong undercurrent. Often pulling grown men under its waves. I put this down to the fact that we were on the cusp of the North Coast. We went for many walks along the beach to the left was the Gran Bahia Principe which is a huge hotel with very little shade, we walked all the way round to where they are building the new Moon Palace Hotel and if you walk to the right of the beach you will come to the Iberostar Hotels, their beach is guarded. There are plenty of local ladies braiding hair if you walk either left or right on the beach. Just past the Iberostars are the local traders huts and my husband went for a run past these and around the few bends and said the beaches were lovely that way. There is a huge pelican that frequents the beach so try and get a picture of it when you go. It really is a lovely site to see. There is a ship wreck out to the left of the sea, it is a really lovely view. Many people went out on mini catamarans when the sea was calm as it wasn't too far from the shore. I have said we wouldn't visit this hotel again but I say this because it didn't match our experience of the Iberostar Hacienda Domincus in Bayahibe and the sea was rough in comparison to the sea on the South Coast. We were impressed by the splendour of the hotel but it lacked personality and atmosphere for us. We did meet some very lovely people there from the UK but the majority of the guests were USA/Canadians or German with British being about 3% of the total guests.